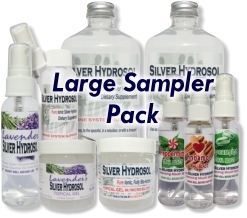 Sampler Packs of Our Colloidal Silver Hydrosol Product Lines! 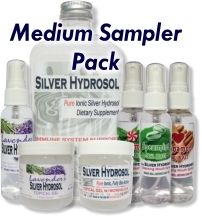 It's our pleasure to offer these four sampler packs of our colloidal silver hydrosol based products! 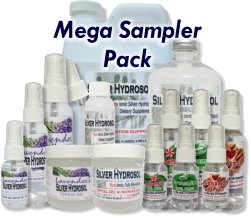 We are always looking for innovative ways to create volume discounts for our customers as our company mission is to make this silver gift of nature affordable to most people. A great way to share with friends and family....keep what you want and gift the rest! 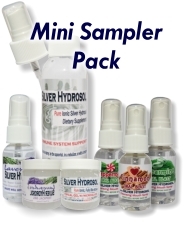 All of these sampler packs are discounted 15% and ship at our flat rate of $2.99, even our Mega Sampler Pack! And our Buy 3 Get 1 FREE offer saves you 25%! No limits. You may change quantities in the Shopping Cart. Buy 3 Get 1 FREE!